Inappropriate attire, lateness, sexually offensive behavior, not to mention productivity and communication issues ... these are just a few of the uncomfortable topics bosses must sometimes discuss with their employees. 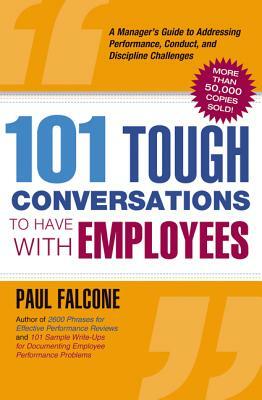 101 Tough Conversations to Have with Employees offers realistic sample dialogues managers can use to facilitate clear, direct interactions with their employees, helping them sidestep potential awkwardness and meet issues head-on. This practical, solution-oriented book walks readers through some of the most common-as well as the most serious-employee problems they are likely to encounter. Covering everything from substandard performance reviews to personal hygiene to termination meetings, this handy guide helps managers treat their people with dignity, focusing not just on what to say but also on how to say it. This helpful book provides proven techniques managers can use to protect themselves and their organizations...and get the very best from their people.